Animal Defenders International : Animal rescues : First big cats SAVED following Guatemala circus ban! 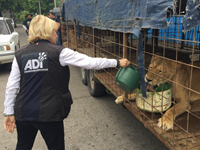 A mission to enforce a new law banning the use of animals in circuses in Guatemala is now underway, with Animal Defenders International (ADI) removing the first animals–lions Sasha, Nena, and Kimba. Watch as the first animals are rescued! Guatemala’s ban on the use of animals in circuses was passed in April 2017. The circuses were given 12 months to relocate their animals, but around 50 animals remain with circuses, including tigers, lions, monkeys, and pumas. It is expected to take many months to complete the documentation and permits needed to take animals removed from the circuses to their forever homes, and ADI is seeking urgent funds to construct holding units and to feed, care for, and treat the animals until their relocation. For the lions, this will be a new sanctuary ADI is building in South Africa, their natural homeland; for the tigers, US tiger sanctuaries have offered permanent homes. Online social cause network GreaterGood.org has launched a worldwide appeal to help raise the funds needed for the ADI circus animal rescue. Please donate here. Keep up with the latest news from Guatemala here.